Evita i fastidi di guidare attraverso South Beach ed esplorare Miami per un giorno in bicicletta. Con questo noleggio di biciclette di un'intera giornata, naviga lungo Ocean Drive, vai in spiaggia e scopri i quartieri vivaci. Respirare aria fresca mentre si pedala attraverso South Beach e godere di viste uniche della città che non si potrebbe ottenere in una macchina. Pianifica il tuo percorso con una mappa della città in omaggio sulla tua divertente avventura a due ruote! Prendi le strade di South Beach in bicicletta! Con un noleggio di biciclette di un'intera giornata (è richiesto un deposito), è possibile sperimentare le attrazioni di South Beach e le aree circostanti a vostro piacimento mentre vi godete il sole e l'aria fresca. Quindi metti il casco (fornito) e pedala! Esplora il quartiere Art Deco, percorri il lungomare e fermati in alcune delle numerose boutique per fare shopping. Meglio di tutto, non ci sono costose tariffe di parcheggio di cui preoccuparsi. Per vostra comodità, riceverete una mappa di Miami Beach, South Beach e il centro di Miami per aiutarvi a pianificare il vostro itinerario. bij aankomst geen fietsen meer beschikbaar, bedrag wel afgeschreven en nog niet retour ontvangen. Dit terwijl zij dit wel zouden doorgeven en terugstorten. 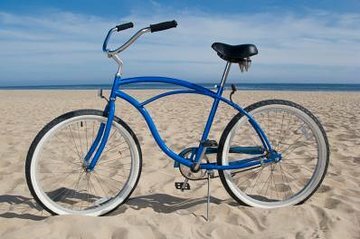 We rented two beach cruisers from the venue and were given the "best" bikes in their inventory. There were at least 20 or so bikes in the store that were all broken with flat tires, broken wheels, missing chains and broken seats. This was an obvious warning that we failed to heed. We started off slow and noticed that both the tires on my bike needed air and the seat kept moving, I should have turned back right then. We made it half way to the south beach peir and boom the chains pops of my daughters bike. I fix the chain. We finally make it to the peir after riding slow and barely applying any pressure to the pedals. We then decide to make or way back up the beach and bam the chain pops again. At this point we decide to return the bikes to the venue, after fixing the chain yet again, we head back to the venue. Seeing that we are about a mile or so away, my daughter tries to ride the bike and sure enough the chain pops and her knee his the handle bars splitting her knee open. HORRIBLE!! We walked the entire way back and turn the bikes in only to be met by the most volatile customer service I have ever had. I explain my situation to the girls at the counter and the blame game starts. "Who checked the bikes out?" "Not me, wasn't me, not me either" no one wanted to take responsibility for doing a safety check. The manger was no where to be found and when the girl called him she told me "my manager doesn't care, I'm sorry." They refused to refund my money, they refused to fix the issue or even try to make the situation better. Please take this review as solid advice and DO NOT DO BUSINESS WITH BIKE MIAMI/HALF PRICE TOURS! Their bikes are old, dirty, broken and dangerous the customer service is a wreck. Run far away from this venue. You are better off renting a art deco bike. Though old, gearless and only one equipped with basket, still best price for one day rental in SOBE. price was for 24 hrs, even better! Terrible. Bikes in poor condition. Service bad. We didn't do the activity in the end as when we went to the shop to rent the bikes there were none available!! We would have had to walk 30 mns to the next shop to get some. Disappointing! De belles ballades a faire sur miami beach mais petit desagrement juste a qq metre du magasin j ai perdu le panier porte bagage ! It's certainly a good idea to tour Miami beach on bikes; except the bike trails weren't nicely set up and observed.. The bikes were heavy duty, but difficult to maneuver (back paddle to brake only, without any speed)..